A multi-racial, multi-generational crowd donning grey sweatshirts, tank tops and even scarves greeted me as I entered the Royal Farms Arena this Sunday. And I have to admit I was doubtful (after purchasing my scalped ticket-shhh) as I made my way to the upper tier, that this venue would fill. However, to assume that Prince’s Rally 4 Peace would be poorly attended on Mother’s Day was a sad mistake on my part. As the floor began to fill up with energetic fans, I knew this day would always be fondly remembered in the hearts of Baltimorians. Just behind the satin purple curtain, Prince was waiting. He came to Baltimore attempting to do what all the marches and protests aspire to—unite a city struggling for justice. Before I begin let me note that this was not the only event this weekend that was symbolic of Baltimore’s slow recovery. The Maryland Film Festival took place primarily in the neighborhood of Station North and received national attention. Writers and filmmakers such as John Waters, Ta-nehisi Coates, and Taylor Branch attended and it attracted a turnout well-over 20,000. And at $375 for an all-access pass, it provided a much-needed economic stimulus for the city. The festival showed both films of general entertainment value, as well as films that tackled challenging issues such as race and sexual orientation. Despite the concert starting almost an hour late, Prince entered the stage cool, calm and collected in a matching gray, flowy pantsuit. This was apropos considering he instructed the audience to wear grey in honor of slain Freddie Gray. He and his band 3rdeyegirl, jumpstarted the concert with many vibrant classics that got the crowd riled up and up on their feet. And of course the crowd knew all the words to songs such as “Take Me With You,” “Raspberry Beret,” and “Let’s Go Crazy”. 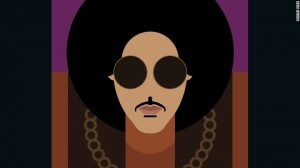 However, the first major highlight of the show occurred when Prince projected a “Breaking News” icon on the screen behind him and debuted the first live version of “Baltimore.” Erin Allen Kane performed a fantastic solo on the new track and Prince brought out Democratic State’s Attorney Marilyn Mosby, dressed in a sparkly black dress. She and her husband shared a brief moment on stage next to the purple one before returning to their special on-stage seats. While she received some negative push back from social media, her appearance seemed to please the already-roaring crowd. Prince is no stranger to using his celebrity platform to draw attention to injustice. One of the first times he did this was in the early- to mid-90’s when he started appearing with “slave” written on his face. This was his way of showing his disapproval of his Warner Brothers album contract. But more recently as a presenter at this year’s 57th annual Grammy awards ceremony Prince was lauded for saying, “Like books and black lives, albums still matter.” So when he spoke to the audience and said “to those who have lost loved ones, we are your servants tonight,” it was no surprise. The concert was chock full of surprises. One major surprise was when Doug E Fresh appeared on stage with Prince to perform “Kiss.” The Rapper/MC hyped the crowd up and became temporary side-kick to Prince. A bit later Prince brought out Judith Hill, another well-known female vocalist. Ms. Hill possesses a powerhouse of a voice that I can only compare to Prince’s old vocal companion Rosie Gaines. Hill has a gospelly feel that can melt even the most stoic patron. Of course there are things that everyone expects at Prince concerts—his iconic symbol microphone stand, wardrobe changes, guitar playing femme fatales and infamous dance moves. Despite the fact Prince was wearing sneakers (and not his usual 3-4 inch heels) as he jumped around like a youthful teen, he hasn’t lost any verve as he’s gotten older. Even his vocal range is still intact as he transitions between tenor to falsetto with ease. With only two wardrobe changes, both of them having caricatures of the man himself on the front and back, the Purple One still managed to be fashion forward. The fake ending was when Prince sang Purple Rain and disappeared off the stage. The audience stomped and cheered until the he returned and said, “ya’ll gone have to buy me a house out here. A brother could get used to this.” He returned for the “real ending,” his finale, to sing three more songs, including the groovy tune “Dance Electric.” This track was produced by Prince and André Cymone. In a final gesture of solidarity, Prince urged the crowd to chant “Baltimore” in the final moments of the concert. I must mention that during one musical interlude Prince began to speak to the crowd like a preacher does his congregation. He said, “The youth is our answer.” No more than with his Grammy statement, I wasn’t taken aback by this suggestion. He also advocated for economic viability. He said, “One day I want to return and stay in a hotel owned by YOU. One day I want to be driven to the airport in a car service owned and operated by YOU.” Prince was urging young people to take the forefront both in protesting for justice, but also in changing the economic inequality that exists in Baltimore. In a city where too much of the population is plagued by unemployment, homelessness, and racial unrest this was a needed call-to-action. If you needed concrete evidence, you didn’t have to look far. “Stop Murder by the Police” signs, which were being handed out before the concert began, littered the ground right outside.